This is a pretty good one! Today I found the Way Huge Aqua Puss MkII Analog Delay on sale. This pedal lists for $254.61 and is usually available for $150, but is on sale for only $119.99 at Amazon. That’s $30 off the going rate.. not a bad deal at all on a great sounding delay. The Way Huge Aqua Puss MkII will give you 20ms delay to 300ms. For those of you not familiar with analog vs. digital sounds. Analog delays tend to sound dark and have a bit of modulation in the trailing signal, where a digital delay can have perfect repeats. When I think of Way Huge Aqua Puss, the musician that comes to mind is John Mayer (though he plays with the original vintage Aqua Puss). For more information, you can view John Mayer’s Pedal Line Breakdown. 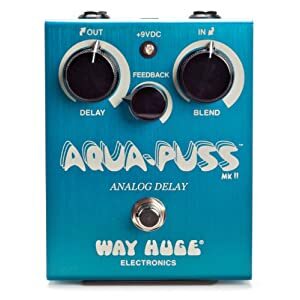 Again, the Way Huge Aqua Puss MkII Analog Delay is on sale for only $119.99 at Amazon. At the time of this posting there were only 4 left in stock. When the number gets to 1 or 2 the price sometimes increases, so if you want it… best to jump on it.